This is a statement cane for use on special occasions. The elegantly tapered black hardwood shaft is fitted with a crook handle that is encrusted with Swarovski Elements crystals. A 10mm diameter Swarovski Elements crystal is fitted to the end of the crook handle. It is an extremely striking piece. 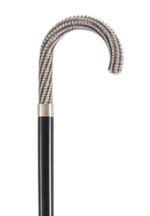 Fitted with a metal ferrule, this cane is suitable for light balance and support only. Care must be taken not to drop or mistreat the handle so that no damage is caused to the crystals. The overall height of this extremely striking cane is 92cm (36").